European Blackjack is a popular card game - an analogue of classic Blackjack. 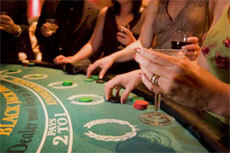 European Blackjack is widely popular in European countries. This game traditionally played with 2 decks of cards. The rules of European Blackjack are the same with traditional Blackjack rules. The main objective of the game is to achieve 21 without exceeding this total. Players make wagers and then they are given 2 cards: one face up and one face down. The dealer takes two cards as well. Then you have to make several options you think might help you to win. You win in Europe Blackjack if you get 21 before he dealer gets the same hands total. In such case you get your winning sum that is quell to what you have bet. If you receive a Natural hand - then your payout will be 3:2. Other cards are counted to their value. As well as in classical Blackjack or any other its type - Insurance is not recommended at all. The dealer should take additional card till he gets 17. Then he has to stop. You Stand when you think you hand's total satisfies you. You Hit an additional card if you want to increase your hand's total. You Split two alike cards into two separate hands. You can Double Down your bets and Hit an extra card. If you suggest that dealer might have a Blackjack because one of his cards is an Ace - you may take insurance, which is not recommended. Surrender option is permitted in European Blackjack. If you see that game favors you - you can increase your bets. You can use Double Down option on the hands with total of 9-11. If you have Split once, you aren't allowed to re-split or double down your bets. If you Split two Aces - you can Hit then. In European Blackjack you can play one hand. The best strategy is to be acquainted with odds.